Apical Group is committed to no new development on peat areas with 65% organic soil or more, regardless of the depth. 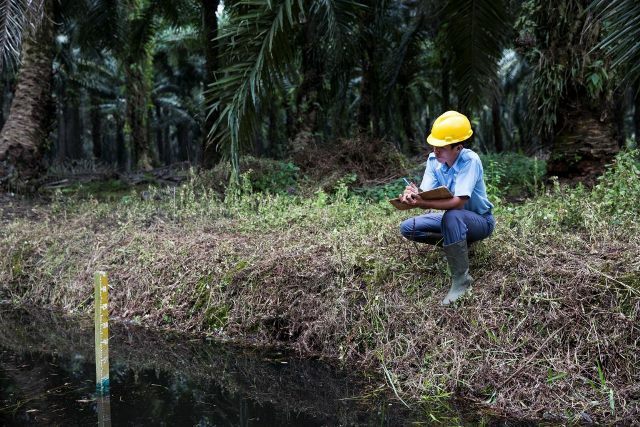 Through supplier engagement and customised workshops and programmes, we encourage and support our suppliers to adopt best management practices on peat in pre-existing plantations as defined by RSPO and peat experts, effective water management to maximise oil palm yield and minimise GHG emissions in existing peat estates. We provide guidance on proper water table management and implementation of water management monitoring plans, ensuring that water table depth is maintained at appropriate levels. We also continuously collaborate with stakeholders and community experts to explore options for long-term restoration or alternative use, in areas where existing peat is unsuitable for replanting. We adopt and promote best management in soil management in our supply chain in accordance with the RSPO Principles & Criteria, particularly in good practices on enhancing soil fertility, minimizing soil erosion and degradation for enhanced productivity, and avoidance of extensive planting on marginal and fragile soils, if necessary.